There are some ski areas you know you’ll want to return to over and over. Alta is one of those areas. A skiers-only mountain (snowboarders are not allowed) set in Little Cottonwood Canyon, Utah, Alta isn’t so much a resort as a small cluster of lodges, with one or two hotels thrown into the mix. The scene is local but most importantly, the mountain is a haven for powder hounds. Utah ski resorts are famous for the fact that they get an average 500 inches of light, dry powder each season, so-called ‘champagne powder’ that lures powder fans back time and time again. Locals say February is the best month for ‘pow’. Following a big snowfall, powder fanatics spend ages poring over weather forecasts and latest snow reports to decide which ski area to hit. 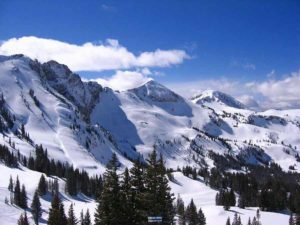 It’s often a toss-up between Powder Mountain near Ogden (the name speaks for itself) or Alta. Skiers who are familiar with Utah’s resorts base themselves in Salt Lake City, driving to whichever resort has the best powder each day. There are lots of resorts to choose from, including Park City, home to the Sundance Film festival, the Canyons, Snowbasin, Snowbird, Powder Mountain and Alta. After a heavy snowfall, many head up the canyon and get stuck in at the Alta Peruvian, a very laid- back lodge with hot tubs, dorm accommodation and excellent food. It is possible to literally get ‘stuck’ at the Peruvian Lodge; when avalanche warnings are issued, the lodge initiates a ‘lock down’ which means that no-one can leave the building until the following morning or whenever the avalanche risk is downgraded. In the lodge bar, locals mix enthusiastically with guests, something that doesn’t happen too often in European resorts. You’re likely to end up chatting to a guy who clears snow for a living or some wealthy local who owns his own little resort somewhere down the canyon. Of course, Utah is also famous for its Mormon population. The downside to this is that when you want to go for a drink in a bar, archaic laws dictate that you must first fork out a few dollars to become a ‘club member’. However, the upside to skiing in a Mormon state is that on Sundays – the busiest day of the week for most ski resorts around the world – Utah’s slopes are quieter because Mormons are busy worshipping. This leaves more fresh tracks for the rest of us. At Alta, there’s a powder protocol that stays the same year in, year out. By 8.30am, powder hounds begin queuing at the Collins lift to be first up the mountain. Once there, they race each other to find the best powder stashes. More often than not, they head straight for High Rustler, following a high traverse, then side-stepping onto a 40-degree piste for a glorious ride down in light powder. ‘Bring your snorkel’ is the line of the day when there’s been a massive dump of snow. Local hotshot skiers are only really impressed when there’s so much snow that it hits them in the face as they ski down, giving them so-called ‘face shots’. After High Rustler, it’s on to Gunsight for more powder glory and if you’re lucky, a run down the infamous Baldy Chutes. If and when you can finally drag yourself away from Alta, head to Ogden Valley and check in to the luxurious Lakeside Village overlooking Pineview Reservoir, for easy driving access to Powder Mountain and Snowbasin. Or stay in Ogden itself, a town that was once described as too wild for Al Capone with its bootlegging, prostitution and gambling but which has gladly replaced those particular attractions with skiing and climbing. The town was named after trapper Peter Skene Ogden in the 1800s and is rich in the history of trappers, traders and explorers. Snowbasin hosted the downhill, combined and super-G events during the 2002 Winter Olympics. Like many of Utah’s resorts it looks small and has few lifts but is deceptive, with excellent off-piste terrain accessed from its upper bowls. Grizzly, the men’s downhill run, is well worth a run with sharp, intense turns that will take you up to speeds of 70-75mph if you have the nerve and the talent. From the top of the mountain, you can enjoy great views of the Wasatch Mountain range as well as views of Nevada, Wyoming, the Ogden Valley and the Great Salt Lake. Snowbasin has the same owners as Sun Valley ski resort and while it boasts a number of beautiful wooden lodges for dining, there’s no accommodation at the ski station itself. Stay at Ogden and get to Snowbasin by commuter light rail or if you have a car, stay at the Lakeside Village, a ten minute drive away. Powder Mountain is a real locals’ spot. The cafe puts you in mind of some of Scotland’s smaller ski areas but don’t be fooled, when there’s been fresh snow, Powder Mountain comes into its own with cat-skiing for access to untouched stashes, powder safaris, and chutes, bowls and glades that will keep the most fanatical powder fan happy. n Catherine Murphy flew to Salt Lake City with Delta Airlines. She stayed at the Lakeside Village in Ogden Valley and the Peruvian Lodge in Alta. Topflight can tailormake trips to Utah – see www.topflight.com for further information.